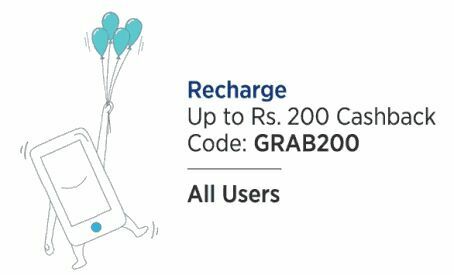 Paytm is again Back with Amazing Cashback Coupon GRAB200 where you can get Upto 200 Rs On Your Recharge & Bill Payments. Apply This Coupon While Making Payment Online And Save Upto 200 On Transaction. • Cashback will be credited within 24 hours in your Paytm wallet. - Get 4% Cashback up to Rs. 200. - Promocode can be used 5 times per user per number. - Promocode is valid on Mobile Prepaid, Mobile Postpaid, DTH, Datacard Recharge, Landline transactions. - Cashback will be credited within 24 hours of the transaction into user's Paytm Account. - Promocode is valid on Web & App. - This code is not applicable in Airtel Transactions. - Paytm reserve the right to end any or all offers at our discretion without any prior notice.